Gravel bikes have had a huge impact on the cycling market in recent years. 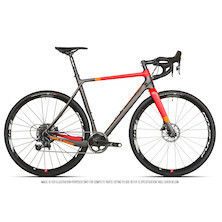 They blend the off-road speed of a cyclocross bike with the go-anywhere ability of an XC mountain bike and the tarmac manners of your favourite road bike with the load-lugging capacity of the touring bikes of yesteryear. They’re the do-it-all multi-tool of the cycling world and they solve the N+1 problem for many cyclists. We’re huge fans, what more can we say? Here’s a triumvirate of our best-selling SRAM Force equipped gravel bikes, each slightly different in look and specification and capable of helping you to break new ground with your cycling. Titanium sits head and shoulders above all other metals used for building bicycles. It has a blend of strength, stiffness, durability and striking good looks that make it an easy choice for the discerning cyclist. Our Tempest takes all the benefits of titanium as a frame material and marries them with a straight tracking fork, comfortable geometry and big tyre clearances to create a bike that eats up the miles and offers rolling comfort like no other. Built from butted titanium tubing the Tempest offers a magic-carpet ride, smoothing out the lumps and bumps to carry you serenely to your destination. With a satin brushed finish, it can be cleaned off in seconds and of course, titanium is famous for being 100% rust proof and corrosion resistant. It’s a smart choice for any bike. SRAM’s Force 1 HRD groupset mixes up the wide gear spread and rock-solid chain retention that it’s off-road racing groupsets are known for. Narrow-wide chainrings and a clutch rear mech are in full effect to ensure you’ll never drop a chain no matter how rough the going gets. Powerful hydraulic disk brakes come as standard and are unaffected by weather conditions; wet or dry they offer the same great, instantaneous stopping power. If you’ve only ever used rims brakes you’re in for a big surprise the first time you grab a serious handful of anchors. The Tempest Force 1 HDR rolls on 700c wheels from Clement. With years of experience as an off-road and CX tyre manufacturer Clement have put all their know-how into these wheels. Lightweight, stiff, and with a 6-pawl freehub, they’re a cut above your typical gravel bike wheels. If you’ve come from a road cycling background and are looking to break out onto the rough stuff the Tempest is the ideal bike. The mystique is quickly building itself a reputation as a serious adventure bike. Built for the backcountry it comes with load-lugging ability as standard. Capable of taking front and rear panniers, mudguards and of course frame, bar and saddle packs the Mystique can carry you anywhere you can imagine. Handmade by the same team who make the UCI approved Holdsworth Super Professional road frames the full Mystique’s full carbon frame and fork are designed to soak up the rough tracks and trails. A relaxed gravel geometry puts you in the right position for a comfortable day in the saddle. A short back end helps you to put the power down and makes spinning up even the longest drags easy work. Serious adventures need serious load-lugging capability and the Mystique is built for the long haul. Front and rear pannier mounts come as standard and can be used simultaneously with full-length mudguards. There are three bottle cage mounts on the frame and plenty of space for fitting saddle packs and bar bags. SRAM’s Force 1 HRD groupset provides a broad gear range with an 11-42t cassette out back having enough at the top and bottom of the range for fast road work and off-road adventures. Powerful hydraulic disk brakes, using the latest flat-mount fitment, offer sure-footed braking performance. Mix this with oodles of off-road grip and fast-rolling on-road performance from our lightweight Rock’n’Road folding tyres and you have an incredibly sure-footed package. If you want to get away from it all and are looking for an adventure bike that’s in it for the long haul, then get transcontinental with the Holdsworth Mystique. The Space Chicken is a bike with a split personality; gravel, touring, cyclocross, big wheels, big tyres, huge load carrying ability, built for 1X drivetrains and kitted with flat mount disk brakes the Space Chicken is ready for anything. With a dropped drive side chainstay the Space Chicken can take a larger front chainring to maximise your road speed making it perfect for those road-based adventures. The Space Chicken has a more forward geometry than the Mystique, favouring riders who prefer a quicker handling bike with obvious CX sensibilities. It also plays into its ability to accept 650b wheels, retaining the handling and stability that bigger wheels offer but lowering your centre of gravity to make the most out of that off-road cornering traction. The Space Chicken is supremely poised both on and off road in either wheel size configuration. Versatility is the byword of the Space Chicken, as well as space for three sets of water bottles it comes with routing for a Stealth dropper seatpost for the ultimate off-road experience. It’s the perfect bike for the cyclist who can’t choose between capable and fleet-footed 700c off-road bike, fast rolling 650b for tough trails or a versatile tourer that will excel on road or off. The Space Chicken does it all.